Healthy Banana Ice Cream is so easy to make and tastes amazing. A delicious dessert made from only bananas (and any additional ingredients you may choose to add). I always have a stash of frozen bananas in the freezer. They are great for making frozen desserts, for using in smoothies or to simply eat as they are. 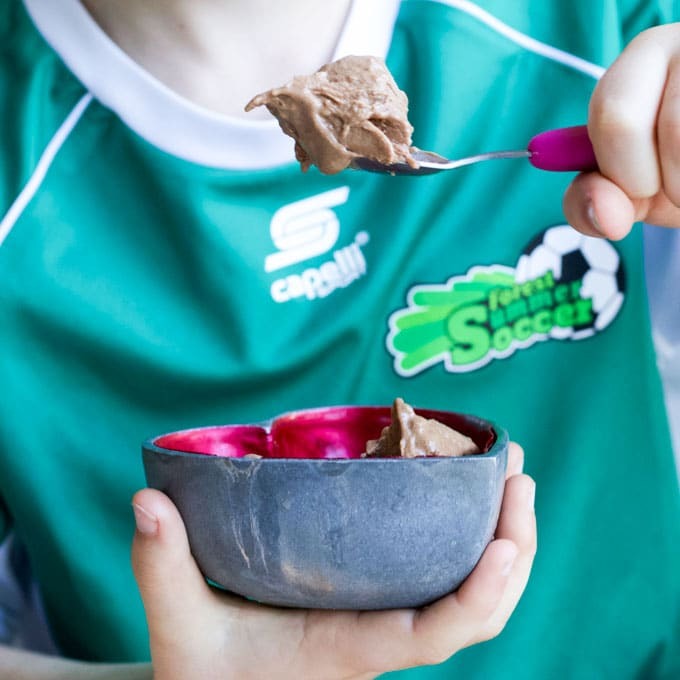 One of our favourite ways to use frozen banana is in this delicious Banana Ice Cream. *This post was first published in Jan 2014, I have updated it with new photos and more information. For best results use ripe or overripe bananas, green bananas do not work well. After around 2 hours the slices can be transferred to a freezable container/bag and stored until needed. Once your bananas are frozen you can make this one ingredient banana ice cream in literally minutes. 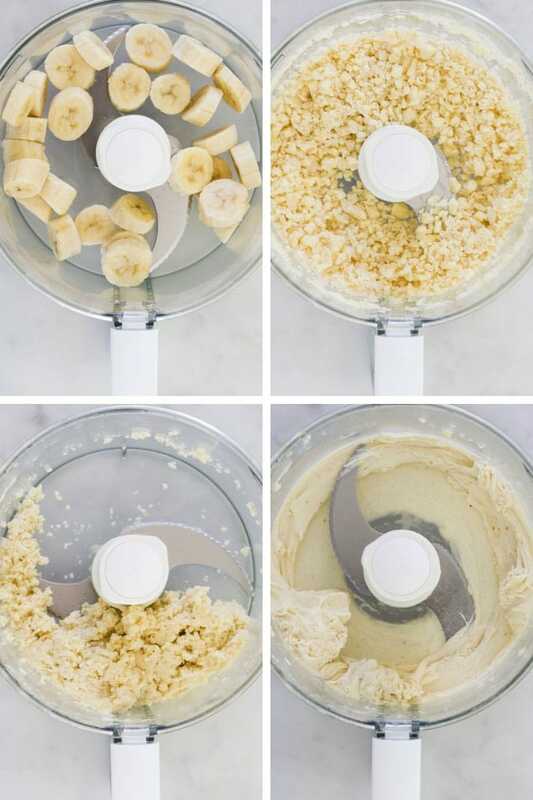 It is so easy and only requires you throwing your frozen bananas into a food processor and processing them. It will start off crumbly, scrape down the sides once you reach this step. The clumps will start to bind together to form a gooey mixture, continue to scrape down the sides. Finally, it will turn into a delicious ice cream with a texture similar to soft serve. Serve straight away or if you prefer a firmer texture, return to the freezer for around 30 mins. I always use my food processor to make banana ice cream, I tried it in my blender and it didn’t work. If you have a high-quality blender (like the Vitamix) then I am sure you could also make this in your blender. One ingredient banana ice cream is delicious but one of the great things about banana ice cream is that it is easy to make a range of flavours. 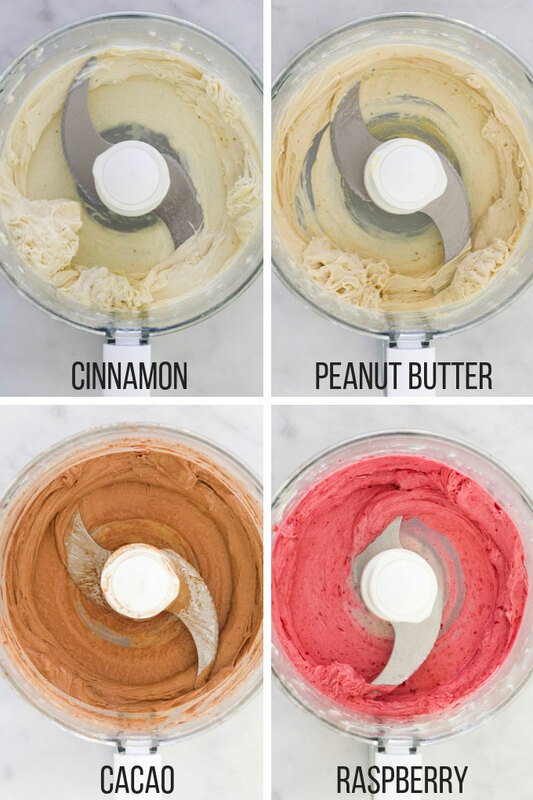 By adding in other ingredients you can really change the flavour profile of the ice cream. Even banana haters wouldn’t know that they were eating bananas! Below I have illustrated some of the flavours we make often. Peanut Butter Banana Ice Cream – This one is amazing! Add 2-3 tbsp of peanut butter before you start blending. Of course, it doesn’t stop there. You really can make whatever you dream up! 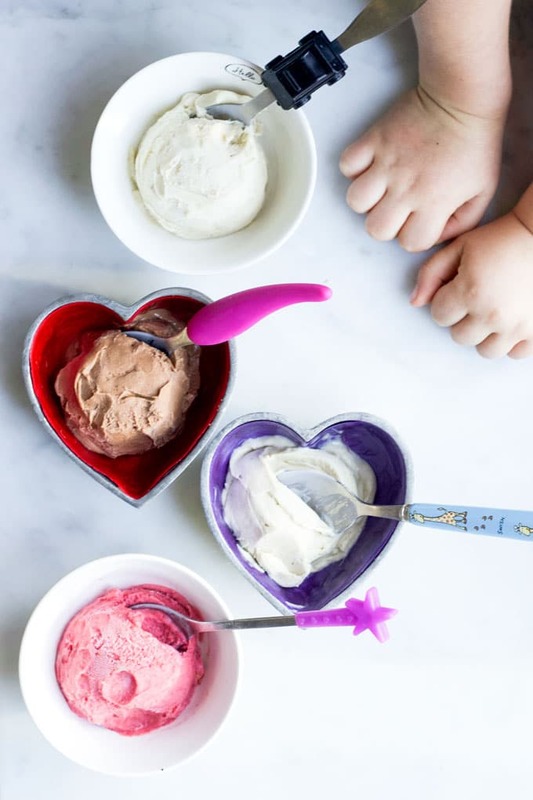 Just experiment with add-ins to create whatever your heart (or your child’s heart) desires! Have you tried this recipe? What flavour did you make? I love receiving your feedback. Please rate and leave a comment below or tag me on Instagram. 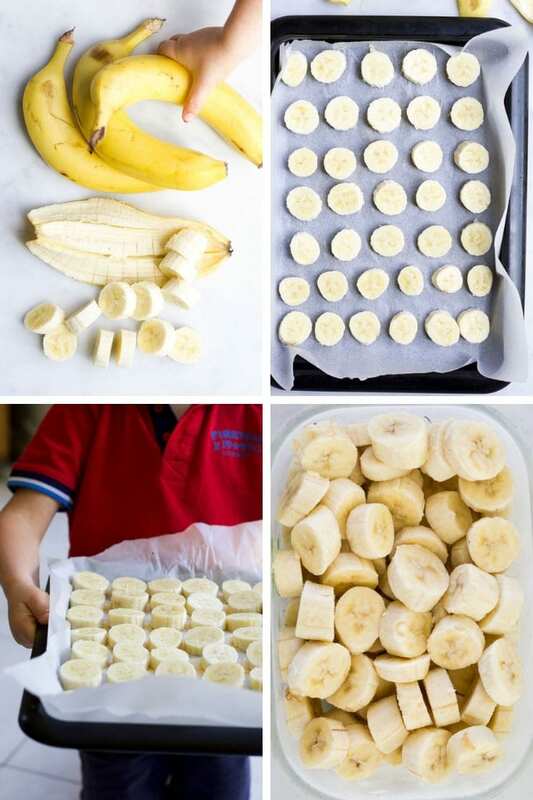 Peel bananas and slice. Freeze on a baking tray (for around two hours) and then transfer into a freezable container until you are ready to use. Using a food processor blend until smooth. At the start of blending it will be chopped into tiny pieces, the pieces with start to clump together and will eventually blend into a creamy ice cream consistency. (see above picture for illustration) Scrape the sides down as it blends. OPTIONAL - Add in any extra ingredients to flavour the ice cream differently. (Pictured I added cinnamon, peanut butter, cacao and raspberry.) Blend until mixed. Serve straight away or return to the freezer to harden further. Nutritional Information is a ROUGH guide only, calculated using an online calculator. Facts will vary depending on the size of bananas used and any additional ingredients you add. Made three flavours of this quick treat last night. All brilliant! Thanks so much for the idea! I’m glad you liked it! Your flavour combos sound delicious. I must give them a try the next time I make this.